Jove seems to have forgotten this neighborhood where I now work. Or have its residents forgotten him? Two condemned houses stood side by side, their weathered signs testifying they had been condemned years ago. They stood untouched until one simply fell, leaving the other standing. City workers came and cleared away the debris of the fallen house, but the other condemned building still awaits its accidental death. When the mayor and the city council speak with pride of all that they have accomplished, they do not mention this neighborhood. They do not speak of how the smoke and dirt of the great trash incinerator lie over the whole region, tainting the air and the water. They do not mention the Superfund site next to my building, the gravel-strewn tainted ground. They do not address how polluted is the Middle Branch of the Patapsco River that flows so near us, that brought business and industry here. I walk through this neighborhood and see no churches, no supermarkets, few local businesses. One Korean family runs a corner store and a laundromat. The old lady gives me a toothless smile as she accepts my card. The fried chicken looks delicious. A few years ago, there was violence among high school students at the light rail stop where I disembark every weekday morning. If Jove is mentioned here, perhaps the residents curse his name. Mercury does not linger here, though I think he visits the laundromat and corner store. Mars is not the kindly though stern father who stores away his arms and armor when the harvest comes, but the enforcer who shoots first and claims to have asked questions later. Ceres’ blessings of grains, fruits, and vegetables are nowhere to be seen. Yet right now, there are rosebushes in bloom all over this neighborhood, planted and tended by people who still care about the beauty of their homes. Red, white, peach and orange, they thrive despite the gritty stink in the air. Clover has sprung up uptended, both white and pink. The gods of the patricians may have turned their eyes away, the protectors of the plebes may have departed in despair, but there are still gods here. Flora and Rosa do not withhold their blessings, even if weeds must grow out of trash pits. Silvanus and Faunus hold sway in patches of woods where birds nest and sing and snakes prowl (finding their way into our warehouse in search of our mice). Cats roam the streets, watching me with calm centeredness, sometimes coming to ask for petting. The Middle Branch rolls on between our train tracks and the docks of the wealthy with their pleasure craft. Vertumnus turns the seasons. The mourning dove coos protectively as I pass, while the mockingbird defends its territory with arias worthy of grand opera. Despite everything, I feel at home in a place that reminds me of the neighborhood where I grew up, and where the gods, despite everything, are present. will answer if I ask for sun, not rain? and days pass beneath a grey veil. Apollo so that he may gladden our faces. intervene, in honor of your mother? Gracious gods, give us sunshine tomorrow! The earth is covered with snow, and the birds are starving. Our cars are buried and frozen, our walkways are two feet deep. into refreshing waters for the earth. Helios, linger overhead, till the bare boughs drip water. so that the small birds and the wild deer can feed. make safe our sidewalks and roads. and clear the ground for the birds’ mating dances. when we burst outside, driven by cabin fever! When she hears his footsteps crunching in the leaves, Pomona knows. It’s always in the autumn, when the leaves lose their green and the apples, her especial fruits, ripen in the waning days. When the oak leaves turn bronze and drift to the forest floor, when the first chill descends with the setting sun, Vertumnus comes home to the orchard. Pomona and the nymphs dance less often as autumn settles in. Instead they gather around a fire started with dead leaves, drink cider, and tell stories. Sometimes Vertumnus arrives by night, when the flames are dancing high and the cider barrel is nearly empty. Sometimes he arrives in early morning, when it is still dark and the goddess is still abed in her bower. 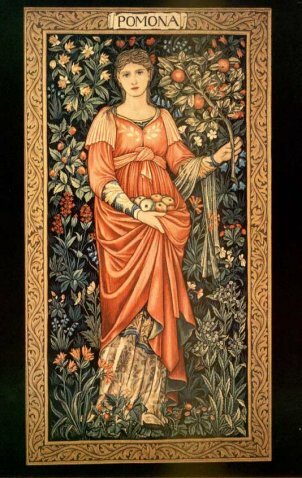 Sometimes he arrives in the afternoon, when she and the nymphs are hard at work gathering the apples, pressing the cider, and he strolls through the busy throng casually eating an apple, oak leaves in his hair, a twinkle in his eye. He always returns. In spring and summer he wanders far, turning the wheel of the seasons. He dallies with Flora in the spring, that wanton hussy with her flowers. Every time she laughs in his arms, another flower opens. Pomona counts the blossoms on her favorite apple tree and knows how many times Flora has come. But she does not lie alone while Vertumnus lies with the flower goddess; she has her nymphs to keep her company, with their long tresses and soft flesh, their clever fingers and tongues. In the summer he ranges yet further afield, seeking the company of other gods. Silvanus, Faunus, Antinous, Cernunnos, Pan–with gods of the woods and the hunt, of the flocks and herds, he sports and spars, wrestling, fighting with staves, gripping and striking until one of them yields and holds turn to caresses, punctuated by rough kisses. She knows that he runs and runs, as a deer, as a bull, as a stallion, as a lion or a cheetah, the strongest and fleetest male of the lot. But he comes back. He grows tired of wandering. He misses familiar trees and landmarks. He yearns for the taste of Italian springs. He notices aches and pains, scrapes and bruises, and longs for a tender touch to soothe them. He listens for the singing of the nymphs and follows it back, back to the grove, back home. She is always waiting. She will always be here. She will offer him wine and cider, venison and good bread; she will let him eat his fill and talk himself dry. And then she will send the nymphs away and lead him into her bower, where she will lay him down and take her fill of him, over and over, with immortal passion, until they are both spent, replete, ready for winter’s sleep. As the nights lengthen, as the cold comes in, as the leaves fall and the acorns, as the calls of the birds grow silent, she will tell him about all the things that happened while he was away, and all the things she plans for the coming spring. And the apple seeds will germinate in the earth of Pomona’s grove while Vertumnus sleeps in her arms, and she will be content. Ave, Vertumne! Hail, turner of the wheel! shepherd us safely into winter.